A friend recently turned me on to the work of James and Karla Murray, photographers who split time between NYC and Miami. 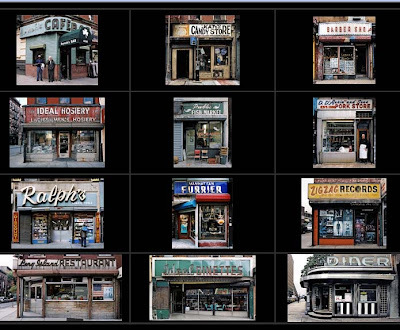 Last month, they released their latest book, "Store Front -- The Disappearing Face of New York." According to their site: "'Store Front' provides an irreplaceable window to the rich cultural experience of New York City as seen through its neighborhood shops. These stores have the city’s history etched in their facades. They tirelessly serve their community, sustaining a neighborhood’s diverse nature and ethnic background, in a city with an unmercifully fast pace and seemingly insatiable need for change. Meanwhile, here's a video they did on Emily's Pork Store in Williamsburg. i went to see the show last week--very nice! and the book is beautiful. I think I can make it there by March 29! I noticed your link to the show in *Everyday Chatter too. Thanks so much for the support! We hope you enjoy the show at BHS.